Its been a while, so should throw in an update of whats been happening of late. 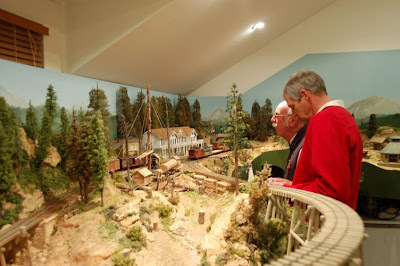 The weekend just past saw the running of the second "Southern Forests" meeting for narrow gaugers, held in the heart of Puffing Billy country, at the town of Emerald. 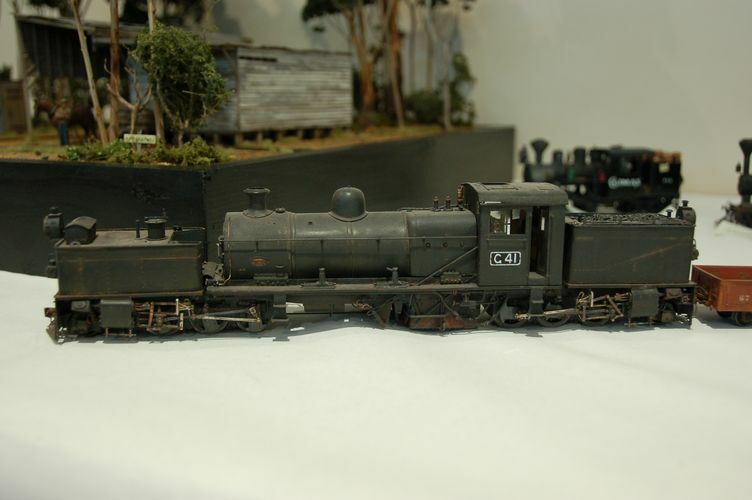 Southern Forests is an event designed to cater for the demands of fellow narrow gauge modellers on the alternate years to the Australian Narrow Gauge Convention (scheduled for Easter 2013, here in Melbourne). I should back track slightly though, since my weekend started on the Saturday evening, with a pleasant BBQ at the home of Gavin Hince, editor of "Narrow Gauge Downunder Magazine", followed by a casual operating session on his On3 home layout. 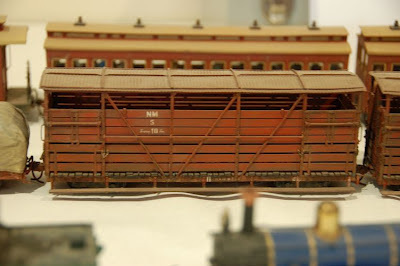 Dinner on the rear patio under a cool Autumn night with around 8 in attendance, with a bit of show and tell of what each has been up too, and then upstairs to the layout room, to attend to the railway demands of the little people of California on the North Coast Narrow Gauge. 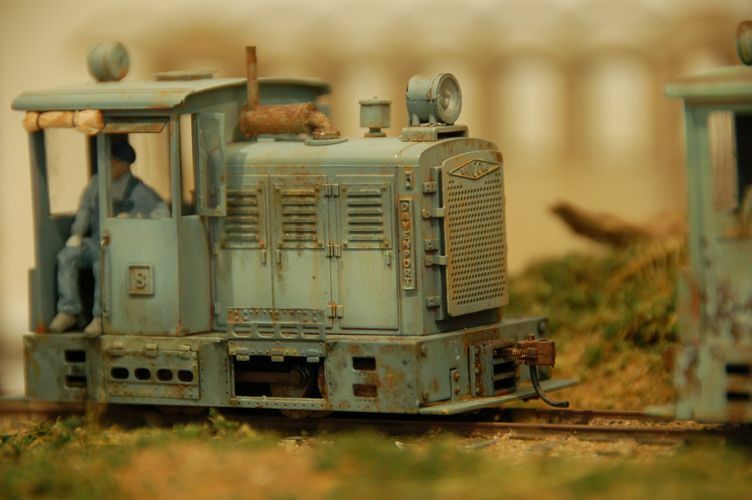 The layout runs using an Easy DCC wireless system, so is well designed for sessions involving 4-5 operators. 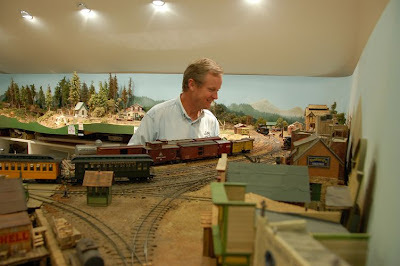 Gavin runs a busy timetable of passenger, mixed goods and logging runs, with a fast clock trying to keep everything on schedule. Running the session takes about 2 hours, with a mid evening pause to try and squeeze in some desert. 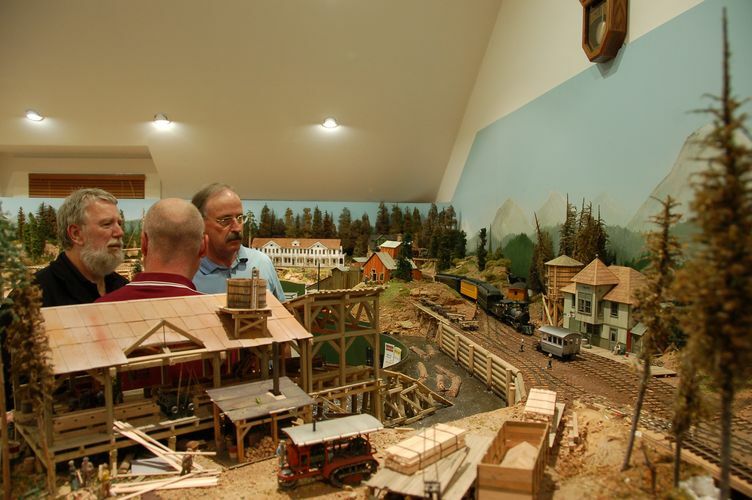 Its a great layout to run on, with well finished scenes, and good mix of structures, and a believable sense of the real world in the way the layout moves from high country logging operations up at "Angels Camp", through several small halts and industry points, to the coastal township of "Lands End". The session is made more challenging, or entertaining, when you throw in a couple of amateur engineers (like myself) to try and negotiate the logging Branch's daily chores. I think I am finally starting to get my head around understanding the operational side of the evening. I didn't have to hide any cars in odd sidings to make the job look done, and wasn't beaten too badly by the flying fast clock! I spared Gavin the indignity of taking photos of the derailment that happened on the rather hard to reach loop above he stairs (lets just say it needs a ladder and a good stretch to correct any unfortunate issues in this particular spot), but the clock was paused for some time! After a late evenings finish, we all retired for the night, to ready ourselves for the early start the next morning up in Emerald. 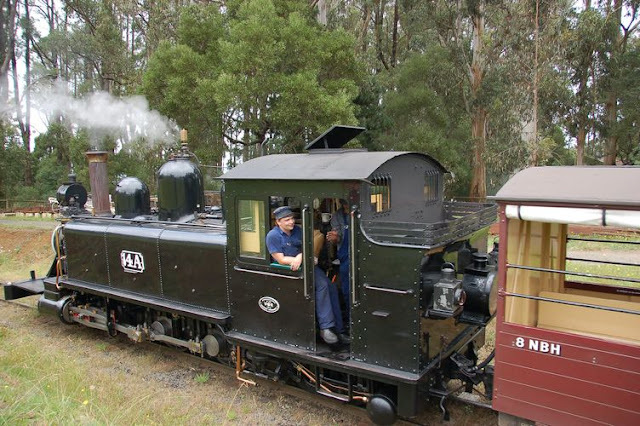 The Sunday morning saw the early start up in the misty hills, with the cold morning awoken to sounds of the Puffing Billy Na's rolling along the 2'6" line. The Southern Forest meeting started with a chartered train from the Menzies Creek station, up the line to Emerald, where the meeting was being hosted at the Gemco Theatre (just alongside the Emerald Station). I couldn't take the charter train this year due to having all my gum tree clinic gear to cart in for the show. 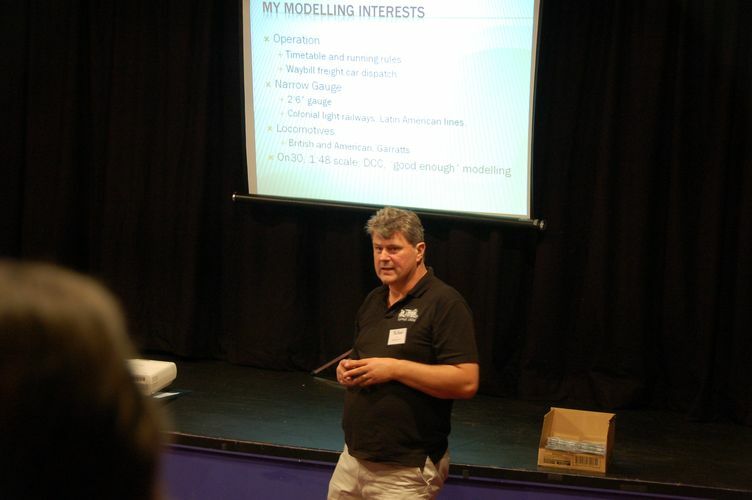 The meeting was well attended, with a comfortable group of around 70 enthusiasts present for the day. A mix of presentations and clinics scattered over the day. 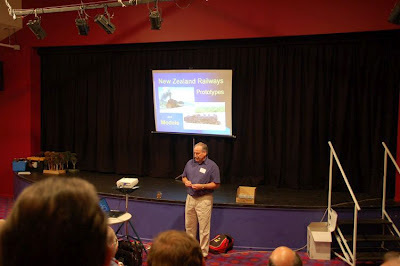 The most interesting presentation for me was from Eamonn Seddon, the CEO of Puffing Billy Railway, with a fascinating discussion about the position of future directions of this world renowned preservation tourist railway. Most interesting to hear the challenges faced in modern times of OH&S and operational requirements, and the demands of maintaining such and old operation whilst pleasing modern standards. There were a number of very nice models brought along for the display, including a beautifully modelled selection of VR narrow gauge roster (the now Puffing Billy's origins) by Melbourne modeller Roger Hill. A filling lunch on the verandah, some inspiring presentations and models, and the sound of "Puff" climbing the grade at the back door of the venue made for a great day. 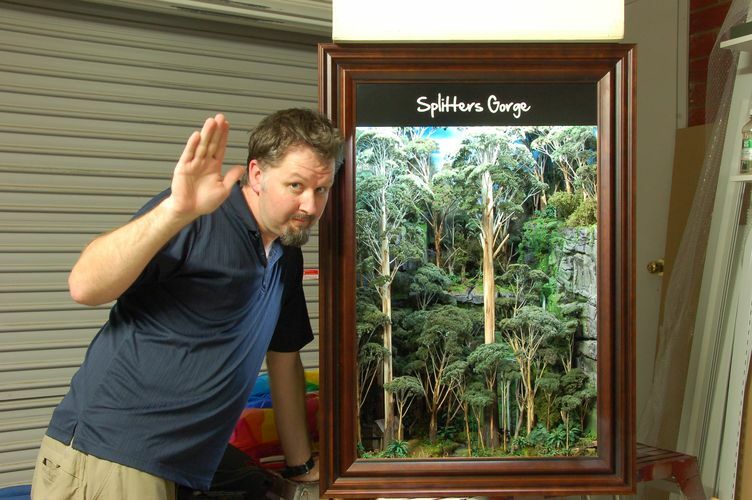 I presented my gum tree construction clinic to a receptive bunch of modellers, and had my "Splitters Gorge" bush in a box out for display in its near complete form. 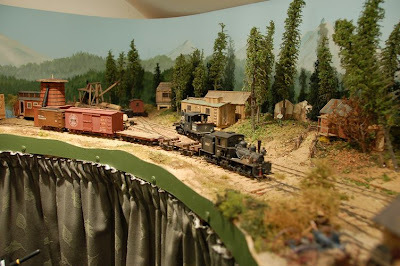 Still some detailing to add around the bush hut, but the scenery side of the diorama was complete, with the new frame and signage to finish its presentation. Didn't take many pics at the show unfortunately (to busy catching up with mates most of the time), but here's a few grabs from the day. I need to mention that proceeds from the day were donated to the Climax Restoration Committee, to go towards getting Climax No. 1694 back on the rails at Puffing Billy. The Climax project is well on its way to completion, with the newest fundraiser, "Coffee for the Climax" underway to continue the financial demands of the project. I am a supporter of this project, and encourage others to get on board (so please check out the link). So I didn't get to take any pics of "Splitters Gorge" on display at Southern Forests, since I forgot my tripod, and time really didn't permit it for me unfortunately. 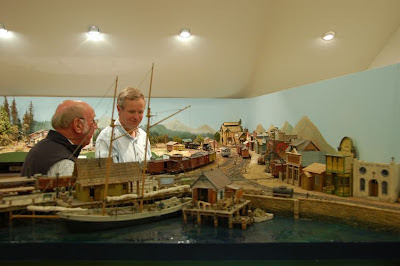 So to make up for it, here's a quick snap with a cameo appearance, which hopefully also helps put the size of the diorama into perspective for you. It was an interesting squeeze into the back of the car, but the diorama travelled well on the day.